The view from the balcony was great! The room had a small library with great themes. We also found a HiFi with cd's of our taste. The building has a big pool, which we did not use, but looked fine! The bed was very comfortable, and the area is very quiet. The owner was very helpfull, and tried his best with our requests. The communication was excellent. Also we enjoyed the reccomendation for a local restaurant for take away dinner! Our host was extremely kind in many ways and very helpful. 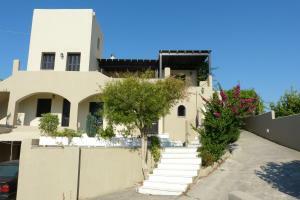 The villa is situated in a small village but close to the site of Knosos. Staying in the villa you get to see life in a genuine, non-touristy village. The small cafes and restaurants are family run and serve delicious home-made food at good value prices. Don't ask for fancy bottles of wine. Drink the local wine - it is cheap and good quality. The villa owns a big but friendly dog who we loved but if you are not a dog lover, she can be a bit over-powering as she wants to play all the time. 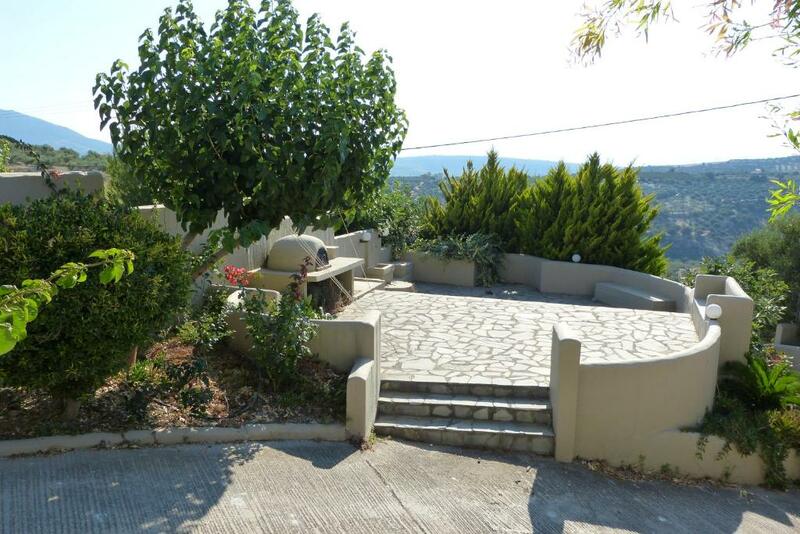 Chambre assez Grande Avec une cuisine commune juste à côté (en passant par dehors) la villa est très belle avec son espace piscine Et idéale pour visite Heraklion Et proximité aéroport . Emplacement idéal, au calme et à quelques minutes seulement d’Heraklion en voiture. Accueil fantastique et très amical, chambre tout confort au calme, bon access internet, très bon petit déjeuner. Le village est authentique et la nourriture excellente. Wir haben dort eine sehr persönliche Betreuung erlebt. Die Anlage liegt abseits der Hauptverkehrswege sehr ruhig am Rand der Ortsbebauung. Wij hadden de villa gehuurd i.v.m. het naderend overlijden van onze vader in het ziekenhuis in Heraklion. De heer Papadakis en zijn vrouw verwelkomden ons zeer hartelijk en hebben veel steun aan ons gegeven gedurende ons 5-daagse verblijf. 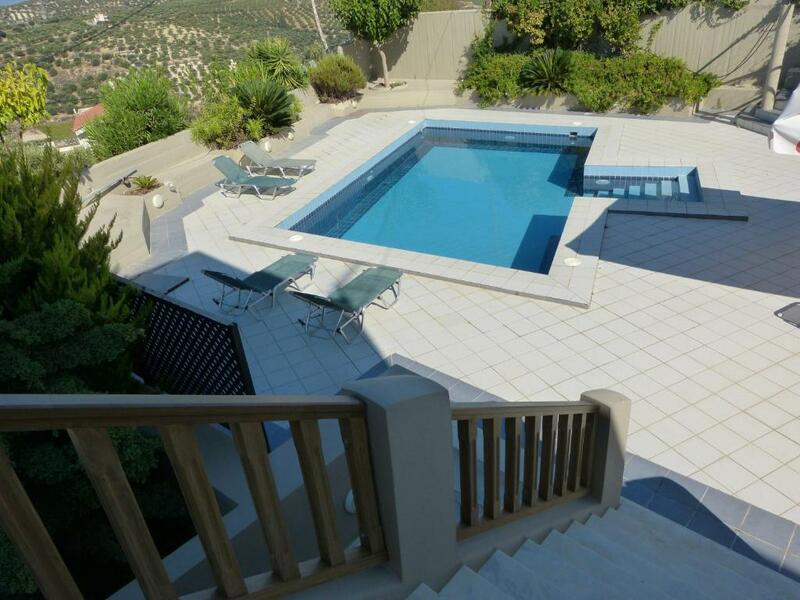 Wij kennen Kreta goed, omdat onze ouders er wonen en deze villa is zeker aan te raden voor vakantie. Ook de omgeving is erg mooi. Het huis ligt iets landinwaarts richting Knossos en vlakbij diverse uitvalswegen. Helaas kwamen wij in het huis wegens verdrietige omstandigheden anders hadden we zeker heel erg genoten! Located in Skalánion, Knossos Palace Secluded Villa provides accommodation with free WiFi and a garden with an outdoor swimming pool and sea views. All units have a kitchen, a private bathroom and a terrace with views of mountain. A dishwasher and fridge are also offered, as well as a coffee machine and a kettle. A continental breakfast is available daily at the villa. Knossos Palace Secluded Villa offers a barbecue. Heraklio Town is 11 km from Knossos Palace Secluded Villa. Heraklion International Airport is 10 km away, and the property offers a free shuttle service. n the picturesque hills of Knosos Crete, in the quiet but lively village of Skalani the perfect all year vacation Villa welcomes your family. The easy access from Port and Airport, its proximity to Heraklion (capital of the prefecture) and its central location on Crete’s north axes makes this Villa an ideal base for exploring the many faced Island. A private entrance leads to the walled half acre of the villas plot. The two level arrangement offers discrete privacy. 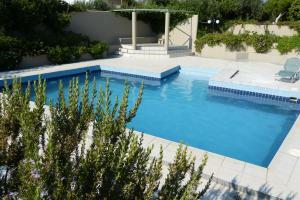 The upper level with its two bedrooms comfortably accommodates a family of four. Two more separate studios each with w/c and shower are ideal for friends or independent youth. The large piscine (65m2) surrounded by flowers and citrus trees shade fragrantly hot summer noons. On the upper floor in the spacious and well equipped kitchen family breakfast and diner can be prepared and served on the veranda with its unobstructed view of the Cretan mountains. Skalani’s traditional market (Grocer, Baker, Butcher), all ingredients of Cretan cuisine are available in affordable prices. The tree shaded central square offers a choice of gourmet taverns. Densly scheduled public transport connects skalani with the entire Island.The Palace of Knossos, cradle of European civilization is a 10 minute drive , so is Archanes on the foothill of Giouhta which offer wonderful choices for countryside walks. One can visit local winery’s and try out wines produced from local vineyards which compose the wonderful countryside. Please note that access to the number of rooms are allocated according to the rate and occupancy booked.